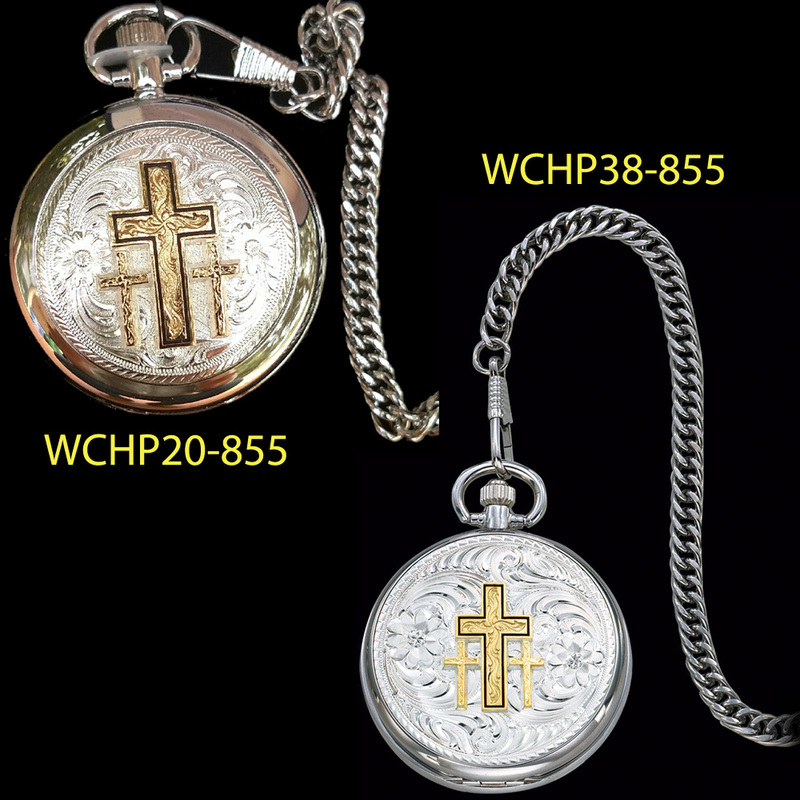 Cross Pocket Watch WCHP38-855 SPECIAL PRICE! 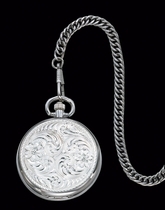 Cross Pocket Watch by Montana Silversmiths. Click the Cross Pocket Watch image to enlarge it. Large 2-inch case pocket watch (WCHP38-855)with a gold triple cross figure displayed on a fully engraved bright cut silver inlay cover (made in Montana). Inside lid is engraved with an intricate circular pattern. Silver filigree detail applied to the face. Latch at the 12 o'clock position. Includes 14.5-inch chain. Accurate and rugged electronic quartz movement. Smaller 1 3/4-inch hunters case pocket watch (WCHP20-955)with a gold triple cross figure applied to the fully engraved bright cut silver inlay on the cover. Inside lid is engraved in tiny circular pattern. Montana Time logo on the face. Latch at the 3:00 position. Includes 14.5-inch chain. Accurate and rugged electronic quartz movement.